It has already been said that “The Burning Serpent Oracle” is not a traditional Lenormand Deck. Ok, I can buy that. It doesn’t have to be. It is still an oracle deck with splendid artwork, that speaks in a clear, distinctive voice. It’s like playing a really fine modern violin. If you are more interested in making music than making an investment to beef up your status- it doesn’t matter that instead of a Stradivarius, it’s made of tuned carbon fiber with an acoustic pick-up. If its voice is true and sweet, and it still allows me to play superb music, that is all I care about! Whatever the instrument- If it does the job, does it really well, and is a pleasure to use- then I’m all for it. I’ve done a dozen “test drives” so far, and the readings came to the point beautifully. The drawings have a lovely pellucid clarity, with subtle coloring that conveys a sense of elegance, and the symbols really sing out! The style reminds me a lot of Pre-Raphaelite art, yet has a modern edge, and is simple without compromising on content. The cards are printed on a good grade of card stock that is substantial without being overly rigid- so that they shuffle well, and the printing is decent quality. The book is nicely produced, in a compact edition, with black and white illustrations in high resolution, so that you can still see the details very clearly. All in all, this is a very classy deck, and the book is well researched and written, with a wealth of information on the symbology and interpretation of each card. This deck does the job, and does it superbly, with style and clarity. It’s gorgeous, it’s well designed and it works for me. A purist might find issue with that, so all I have to say to them is: don’t call it Lenormand. Call it an oracle deck INSPIRED by the Lenormand system. If you’re interested in collecting beautiful decks that function well, then this is a deck that is well worth your time and attention. Five stars, without a doubt. It’s very hard to set down The Burning Serpent Oracle, both text and cards, in order to write a review, as both are fascinating guides to my recent journey toward Lenormand wisdom. Rachel Pollack has written a thorough text, which patiently explains numerous facets of a good working knowledge of the intriguing Lenormand cards. And Robert M. Place, also a talented author as well as skilled illustrator, provides clear and uncluttered artistic images; crafting perfection through simplicity. The synergy of the combined talents of both creators of the Burning Serpent Oracle conveys clear and strong visuals, rich in both color and metaphor. 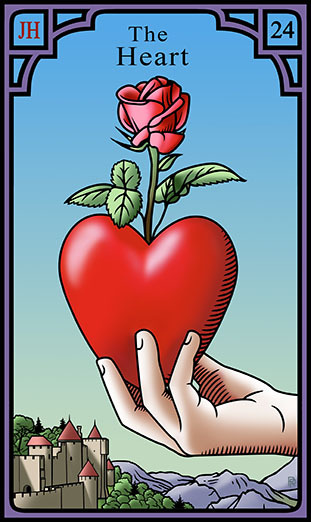 With each card, I enjoy the well-informed and creative variation of Lenormand image; truly this collaboration has yielded so many enjoyable images. The Burning Serpent rises out of an ancient Jewish altar, The Fox is found in 19th century London and a wee butterfly perches on top The Rusted Cross. Many more visual and textual surprises await the reader and practitioner of the cards. Card backs show a variation of Card 1, Hermes the Messenger. Included in the box of cards is a little white book of 15 pages with all the basic meanings. The artwork of the cards has the look of pen & ink with colorful but muted gouache; sensitive souls like me are not overwhelmed with garish and overly strong colors.